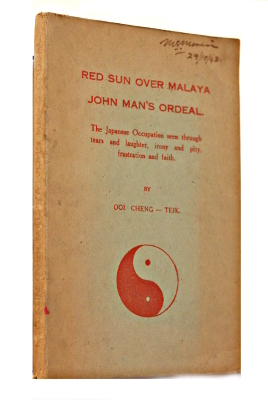 Title: Red Sun Over Malaya: John Man’s Ordeal. The Japanese Occupation seen through tears and laughter, irony and pity, frustration and faith. Publisher: Self-published, printed by the Caxton Press. Kuala Lumpur, 1948. Condition: Paperback. Very good. A scarce book Minor foxing, name inscription on cover. No other defect. Imply the axis spins it every bit? But in the toils of his own wiles was caught. Without a slip, breakdown or utter ruin. More of their kind our necks to choke and wring. Will edify the Monkey’s Way to Power. With Spirit the Master should pilgrim to the Enlightened land.